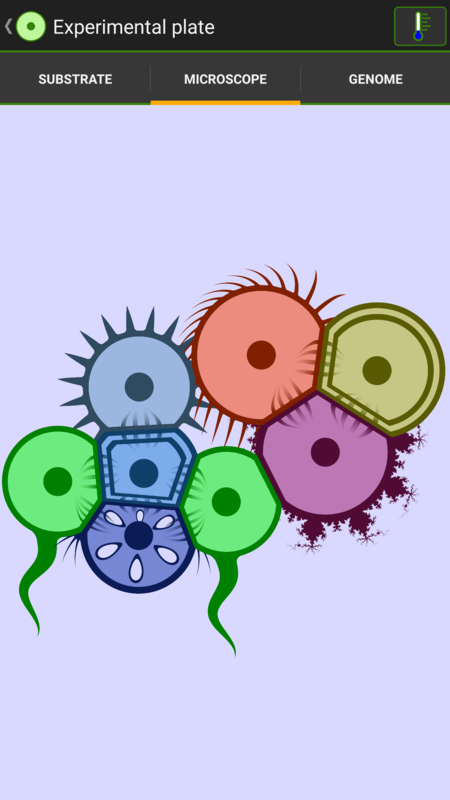 This is a website about the Android game "Cell Lab"
Cell Lab is a simulation game for Android. It is developed by Petter Säterskog. Cell Lab simulates few-celled organisms. It contains 45 challenges where the player is presented with an environment and has to design an organism that will survive in it. Solving challenges unlocks additional genes that can give cells new properties. The encoding of the cells behaviour has been made as intuitive as possible without losing generality but it nevertheless takes a bit of effort to understand. Going through the provided tutorials carefully is recommended. 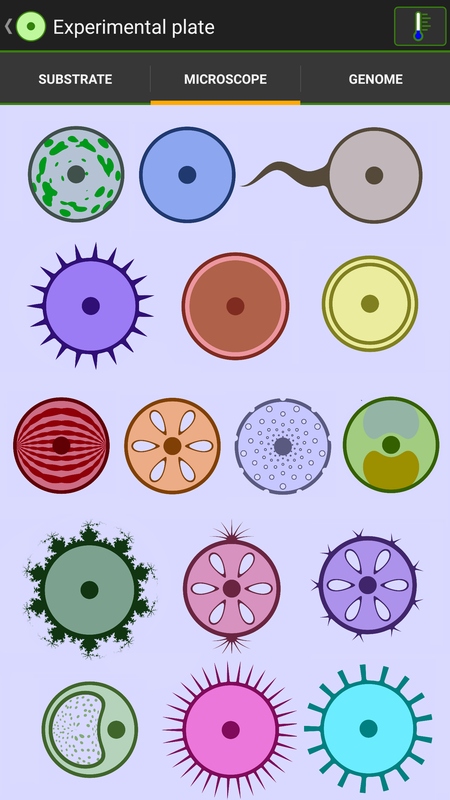 Cell Lab also contains an experimental mode where the user can set the parameters of the environment and put designed organisms in it to see how they multiply (or die). It is also possible to seed this environment with random genomes and once a viable genome has been seeded one can see how it slowly evolves through tiny mutations to an organism well adapted to the environment it is in. It is then possible to change the environment to see how they re-adapt, fast forward the simulation, and finally to save and share it. This simulation is not biologically realistic, all cells in Cell Lab only has one function, to swim, to eat, to collect sunlight, to float, etc . This is not how cells work in nature where one cell can do many things at once. This accuracy has been traded off to be able to make an interesting game. The cells have also been made to multiply very fast, this also for the enjoyment of the user. What is realistic is the evolution taking place in this game. How species adapt to their environment and compete with each other to sometimes attain an equilibrium and sometimes extinction. • Internet access. This is required to send bug reports and other anonymous usage data. • Network state. This is required to make sure bug reports and usage data are only sent over wifi to avoid using mobile data. • External Storage. This app needs to be able to read and write external storage so that the user can send and receive samples as email attachments. Note that installing an older version will typically overwrite any newer version and you will not be able to open files created in a more recent version of Cell Lab. For questions about the game, suggestions, bug reports, ..., please write on the forum. That way your question will be answered rather quickly and more users can benefit from the discussion. For e.g. reporting that the forum doesn't work, I can be contacted at cell.lab.game@gmail.com.